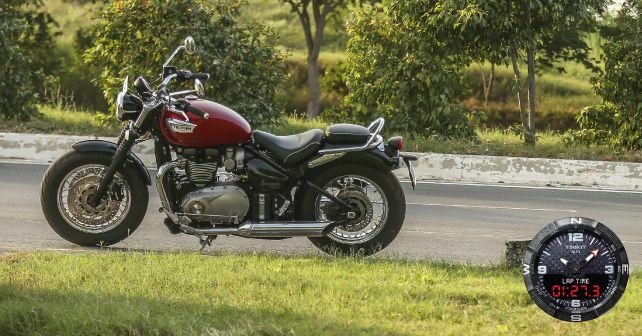 Triumph’s Bonneville range of motorcycles are undoubtedly among the best in the business. Not only are they true to their ‘Modern Classic’ image, but also offer something for everyone. There’s the light and agile Street Twin, the original and classic retros, T100 & T120, the jaw-dropping café-racer Thruxton R and the badass Bobber. In the beginning of 2018 though, Triumph expanded the range further by adding the Speedmaster to the Bonneville range. But, where exactly does it fit and what does it bring to the table? To start with, the Speedmaster is based on the Bobber. In fact, you can say that it’s the practical version of the Bobber. And that’s not just down to the fact that it comes with a twin-seat setup, as opposed to the single of the Bobber. Triumph has made some significant revisions, which, in all honesty, make it a completely different motorcycle to ride. For instance, it comes with curved ‘beach bars’ for a relaxed riding posture, the foot pegs are placed forward in a typical cruiser manner, and it has a bigger fuel tank. More importantly, the Speedmaster gets a cartridge style front 41mm KYB front fork that offers more suspension travel, while the rear wheel gets a dual-rate spring monoshock as opposed to the single rate shock in the Bobber. The result of all these changes is a motorcycle that offers a plusher riding experience, which is more suited for leisure riding and occasional highway trips. Also, despite being a cruiser, it’s handling is good, even on the track. The only thing that limits its progress is the low-set foot pegs, which scrape at virtually every corner. Otherwise, the performance is super impressive. The 1200cc parallel-twin engine is the same as that of the Bobber. It churns out 76bhp and 106Nm. The moment you twist the throttle, the engine delivers dollops of torque in a creamy and smooth manner. The 6-speed gearbox offers flawless and precise shifts. You also get standard ride-by-wire throttle and two riding modes – Road and Rain. Overall, the Bonneville Speedmaster is a versatile and refined cruiser that can do it all. However, we feel that, despite being a great looker, it doesn’t really stand out from the rest of the range.